Through a cooperative effort, the Lake Management District and the Town of LaGrange jointly operate the Water Patrol. 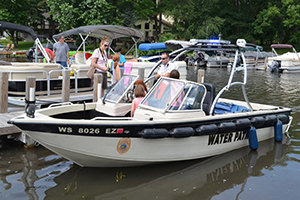 The Water Patrol is staffed by law enforcement officers that are certified by the State of Wisconsin. The officers patrol Lauderdale Lakes and Pleasant Lake, enforcing state and local boating statutes. They also oversee the parking at public boat launches on both lakes and patrol Pleasant Lake Park. LLLMD Commissioner Ron Diederich oversees this project. Our Water Safety Patrol team continues to be led by Chief Ken Blanke, who has served on our patrol team for 39 years. Chief Blanke is assisted by Sergeant Janene Littmann, who has 29 years of experience on our lakes. They lead a team that generally numbers around 15 officers, whose experience ranges from new officers to those that have 15+ years of experience on our lakes. Each officer takes an oath to uphold the law and is required by the Wisconsin Department of Justice to complete 24 hours of formal training each year. In addition, each must take the DNR Educational Program every other year. Our primary focus is safety, and an important part of safety is education. 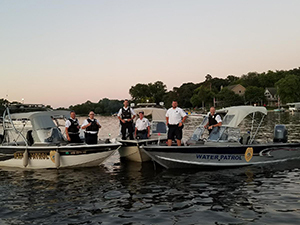 Our team is engaged in our community to promote safety and provide information for boaters, since each of us has a role in maintaining a safe environment on the Lake. In addition to patrols, you may see our officers out and about in our lake community. For example, they serve as instructors for our boating safety classes, speak at the Lauderdale Lakes Improvement Association (LLIA) Annual Meeting, and participate in LLIA’s annual Kids’ Fish Jamboree so the children can climb aboard one of our patrol boats. Wisconsin boating falls under the jurisdiction of the WDNR. With your boat registration, you should receive the Handbook of Wisconsin Boating Laws and Responsibilities. This free publication is available from the WDNR, and can be viewed and printed at their website. Our officers also carry extras on the patrol boats. For even more detail, you can go to the Chapter 30, Wisconsin Statutes, “Navigable Waters, Harbors and Navigation” or Wisconsin Administrative Rules, NR 5, “Boat Rules and Registration”. Local boating laws are covered by the Towns of LaGrange and Sugar Creek Boating Ordinance, which you can view or print at the Town of LaGrange website. The Water Safety Patrol prepared a handy tri-fold brochure entitled “What you need to know when boating on Lauderdale Lakes” which summarizes these local laws. This tri-fold brochure is available in plastic boxes at the boat launches and our officers carry them in the patrol boats. Public boat launch ramps on both Lauderdale and Pleasant Lakes are Town of LaGrange property. Each boat ramp user must pay a $3 daily fee, or a $20 annual fee prior to launching a watercraft. This includes residents and property owners as well as boaters from other areas. A fee collection box is located at each boat ramp, and payment envelopes are provided for you to use. Simply fill in the information requested, include the fee, keep the tear-off receipt, and place the envelope in the fee collection box. Place the receipt on the dashboard of your vehicle. (If you are not parking at the launch, keep the receipt in your boat.) The parking areas at the launch sites are for use only by vehicles that have towed and launched a watercraft. Do not use those parking areas for other vehicles.